I feel so bad now. I kinda promised Elkan that I will be back before his 9pm bedtime but I reached home 40 minutes late. Sigh…I am sure he slept with a heavy heart. Elkan was super excited this evening. He rang me a couple of times, chasing me to come home early. At 7pm, he rang and said "Daddy, I have a surprise for you! What time are you coming home?" I answered 8:30pm. He then said "Okay! Come back early! I have a big block for you!" At 8:15pm, he rang and asked "It is almost 8:30pm. Where are you?" I am still in my meeting. "My bedtime is at 9pm. Come home before that, okay?" At 9pm, I finished my meeting. I called him "Elkan, can you wait? I be back around 9:30pm." He sighed "Okay…but I am sleeping soon. Come back, okay?" I felt very bad. I felt the disappointment in his voice. Along the way home, I told Tracy about the "big surprise" Elkan had for me. I was as excited as my boy. When I opened my door, I saw this very cool toy-formation that he has made. 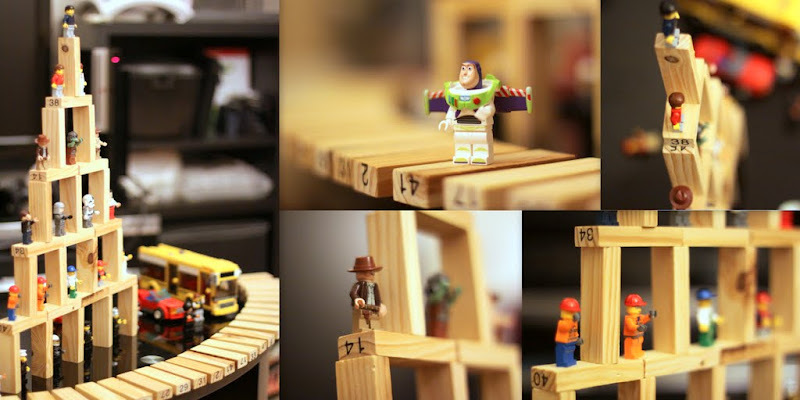 And he placed all his favorite LEGO characters on them. Piece by piece, it must be quite a feat for him to do that! Felicia described how excited Elkan was when he was stacking these wooden blocks. Elkan wanted me to see his creation so badly. He was expecting me to give him that big "hug and praise". Most importantly, he wanted to see that "first reaction" on my face. I am sure he will forgive you. He loves you too much to be upset w you. PS i miss Elkan, you, Feli & Tracy.